The (e)merge art fair presents an extensive line-up of special projects and performances. (e)merge also engages curators, gallerists, collectors, artists and other art world innovators in panel discussions during the fair. That Corcoran Status is a reflective interpretation of the current status of The Corcoran College of Art + Design. Using plastic duck decoys, the artist will fabricate a bridge of similarities between the performance and the recent transactions between The Corcoran and The George Washington University. Bargain Basement University’s team of college administrators will roam the fair and solicit students to enroll in our innovative approach to education. Let us hand-print your degree on site, as we streamline your admission, matriculation and graduation. Get ready to soar. The BackPack Gallery is a series of sculptures that are wearable art galleries in the form of backpacks. The performance takes art out of confinement and into the mobile realm, where art and artists come to the viewer. Artists will create an installation inside the BackPack Units and perform while carrying the sculptures. Continuance is a study of movement. The simplicity of a line of tape represents a sequential stream of moments in time. As the artist applies layers of tape, the movement will shift visually. Viewers are invited to experience the process of continuing change until the project is completed on the final day of the fair. A Democracy of Averages is a highly reflective sculptural object on the hotel pool deck, but it is also a site for a performance event. Music, sound recordings, experimental noise, and interactive works will be presented by artists David Sanchez Burr, Carrie Fucile, Evie Metz, Sorcerer, Cecilia Vidal, and Allison Yasukawa. A Man Ain’t Nothing But A Man is a performative installation inspired by the legend of John Henry, is a survey of man as machine and the limitless black male body. The performance takes the contest of steel-driving into rock as commentary on internal and external pressures to extend the body as a fatally useful tool. The artists, both native Mid-Westerners and East Coast transplants, will create a collaborative sculptural installation and performance that examines an exodus of original place to the contemporary realities of an urban landscape. This movement-based, multimedia performance explores concepts of endurance, confrontation, memory, and love. In this audience activated performance, visitors are invited to browse a "library" of selected books. As participants read aloud, an improvisational drawing/writing will be created on a drawing mechanism modeled after Thomas Jefferson's letter writing machine. The machine creates two identical drawings, one of which will be given to the reader. Moderator: José Ruiz, artist/curator Present Company (Brooklyn). Panelists: Deborah Anzinger, artist/director NLS (Kingston, Jamaica); Heidi Fancher, artist (Washington, D.C.); Sha Sha Feng, artist/co-founder, DIVAS for Social Justice (Brooklyn); Tami Gold, artist/filmmaker (Brooklyn). Moderator: Vesela Sretenović, Senior Curator of Modern and Contemporary Art, The Phillips Collection (Washington, D.C.). 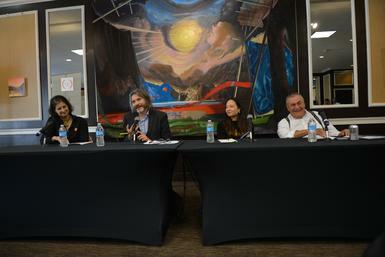 Panelists: David Grosso, Councilmember (Washington, D.C.); Mohini Malhotra, collector (Washington, D.C.); Mariano Ugalde, director, Salar Galería de Arte (La Paz, Bolivia). The Phillips Collection Director Dorothy Kosinski and Curators Klaus Ottmann and Vesela Sretenović will select the winner from works on display at the (e)merge art fair. The Phillips Collection Emerging Artist Prize is made possible by the generous support of Hank and Carol Brown Goldberg. This conversation with national arts leaders explores how artists build communities to support themselves in their work. Panelists: Margaret Boozer, Director, Red Dirt Studios (Washington, DC); Ryan Frank, Installation Manager, The Wassaic Project, (Wassaic); James McAnally, artistic collaborator, US English, and Co-Director, The Luminary (St. Louis); and Abigail Satinsky, Associate Director, Threewalls (Chicago). Produced in collaboration with the Transformer FRAMEWORK Panel series. Institutional and private perspectives inform this discussion on collecting works by emerging artists. Panelists: Marina Galvani, Curator, the World Bank Art Program (Washington, DC); Tony Podesta, collector (Washington, DC) and Mika Yoshitake, Assistant Curator, Hirshhorn Museum and Sculpture Garden (Washington, DC). Moderator: Lisa Gold, Executive Director, Washington Project for the Arts. Panelists: Claire Breukel (Contemporary Art curator and Writer), Adam Budak (curator of Contemporary Art, Hirshhorn Museum and Sculpture Garden), Sarah Newman (curator of contemporary art, The Corcoran Gallery of Art), Jefferson Pinder (performance artist). Moderator: Dorothy Kosinski, Director, The Phillips Collection, Washington, DC. Panelists Robert Lynch, President and CEO of Americans for the Arts; Jamie Bennett, Chief of Staff, National Endowment for the Arts; Lionell Thomas, Executive Director, DC Commission on the Arts and Humanities.